As with most new towers these days, the offices and apartments rising at Hudson Yards are unsurprisingly wrapped in glossy, glass skins. 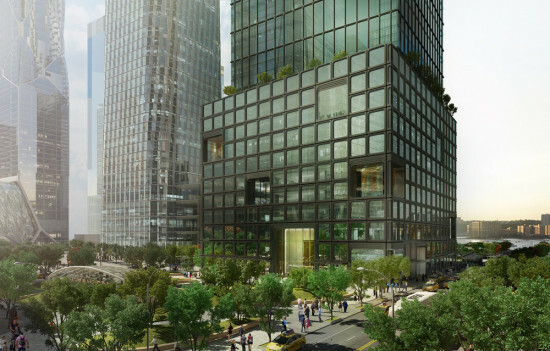 That is why revised renderings for the new kid on the block, 55 Hudson Yards, are so notable. The 51-story office tower has plenty of floor-to-ceiling windows, but those windows are framed by a metallic grid that encases the entire building. At certain points that metallic wrap disappears as if space has been carved out of the building's exterior. The 1.3-million-square-foot tower was designed by Eugene Kohn of Kohn Pedersen Fox (KPF) and Kevin Roche of Kevin Roche John Dinkeloo and Associates. 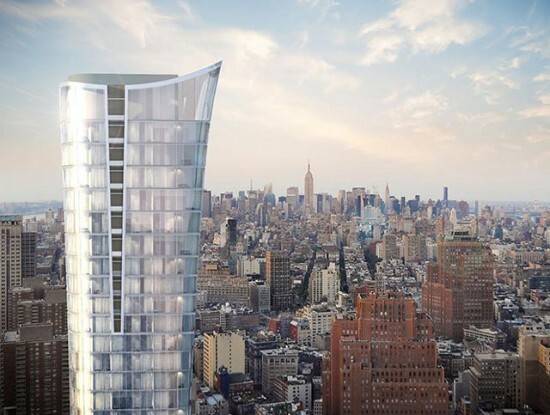 According to a press release from developer Related, 55 Hudson Yards is inspired by “Soho and early modernism.” KPF has designed many of the Yards’ towers, but for this site, Related chairman Stephen Ross reportedly wanted to try something different. According to the Wall Street Journal, Ross asked Kohn to work with a “fresh face” to design a tower that added some architectural variety to the development. That fresh face came in the form of Roche who is famous for designing the celebrated Ford Foundation in the 1960s. Roche told the Journal that, for this project, he wanted to create a building that is “simple and straightforward, that meets the needs of the developers and occupants—a basic, fundamental sculpture." But Roche was reportedly only involved in the early parts of this project, with Kohn and his firm overseeing the major design elements.